This week I was honored to speak on a panel at the Satellite 2016 show at National Harbor across the Potomac from Washington, DC. The subject of the panel was government airborne satellite services. Civil and military use of airborne platforms equipped with satellite terminals continues to expand, fueling an accelerating demand for beyond-line-of-sight (BLOS) satellite communications bandwidth and specialized terminals. Commercial satellite communications are a critical enabler of these operations, supporting broadband communications and the transfer of intelligence, surveillance, and reconnaissance data and other mission critical information. Airborne en-route communications – often used by senior government leaders and offering services consistent with what they have on the ground, including video teleconferencing. The main point here is that these service types each place differing demands onto the satellite equipment and service architecture. This has significant implications both for user CONOPS and future satellite design. Significant changes are here, and will continue at a pace more rapid than any time since the dawn of our industry. High throughput satellite (HTS) systems are just the first stage of architecture and performance game changers, positioning large amounts of capacity in space at only an incremental cost increase over wide beam satellites. HTS satellites do this by using small spot beams, which improve bits/Hertz efficiency, and by frequency re-use, which increases the aggregate amount of capacity. Intelsat’s new EpicNG satellites are designed to increase UAV data rate performance by 2x to 10x via their high-throughput spot beams and enable broadband performance to antennas with apertures smaller than 30 cm. For example, in the case of the Army’s Gray Eagle, users can double their data rates with no hardware changes at all, and increase speeds by 8x with a waveform upgrade. And on the Global Hawk platform, the Air Forces’ elusive 274 Mbps off of the airframe is achievable on EpicNG. These ‘low-disruption’ improvements are possible partly because Intelsat EpicNG delivers HTS with an open architecture, which supports multiple connection topologies. Traffic from a user beam can be routed loopback to the same user beam, cross-connected to another user beam, or reach back to a core beam. Intelsat chose this approach in part to avoid a closed, proprietary system that would carry significant costs for our customers, in both time and money. This means that users can choose their preferred ground equipment, whether that’s an installed base or a new deployment. The ability to use existing ground equipment in open systems can lead to substantial cost savings for the customer. We don’t want to dictate the kind of modem the end customer must use. HTS also provides enhanced protection against jamming. Intelsat EpicNG’s very powerful and narrow spot beams present a smaller footprint and are harder to jam. The digital payload can also be configured to “notch out,” the jamming signal once it is detected and assign a new link to the customer. EpicNG is compatible with protected tactical waveform (PTW), an important enhancement for mission assurance. 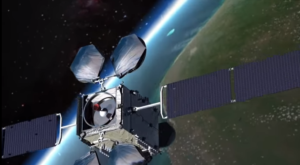 The initial Intelsat EpicNG satellites are a first step towards more capable and flexible satellite designs that will ultimately lead to software-defined payloads which will deliver immense benefits for customers. The move to fully reconfigurable – on orbit – satellite payloads offers the revolutionary possibility that satellite design and launch can be standardized and streamlined. When the beam coverages can be done via software, even more value can be delivered to the government customer. The commercial industry will continue innovating in space, because that is what we’ve always done. These innovations have put us on the cusp of much greater satellite capacity in space, and we look forward to putting this capacity to work for our customers.